Step up to the finest quality workmanship for customized embroidery promotional materials, signs, banners and advertising materials for your business. We also offer an amazing selection of personalized gifts for yourself or your friends that include boat mats, pet mats with amazing laser etching technology that’s the talk of the town. 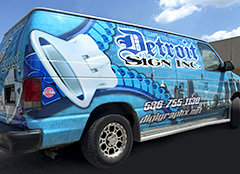 DigiGraphX Co. has joined forces with Detroit Signs Inc. to offer you the highest industry standard for quality and on-time delivery of custom embroidery, quality screen printing, amazing vinyl graphics, logo apparel, sports apparel, indoor and outdoor signs, point of sale signs, banners, and much much more! In addition, you’ll love our new showroom where you can now look and feel each promotional item and sample everything for yourself. Take advantage of our in-house production and quality workmanship on any size order big or small. We also showcase thousands of pens, hats, shirts, coats and other promotional items for you to see and touch. 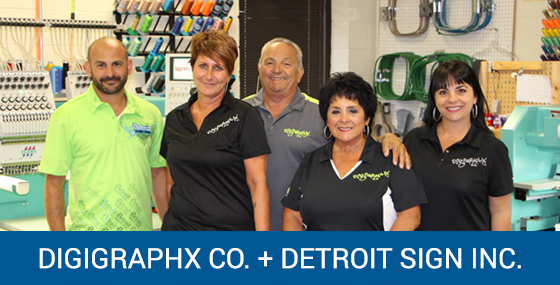 We offer some of the fastest turn-around times in the industry, and DigiGraphX Co. and Detroit Sign Inc. uses only state of the art equipment and the latest technology for superior quality we promise you will absolutely love.